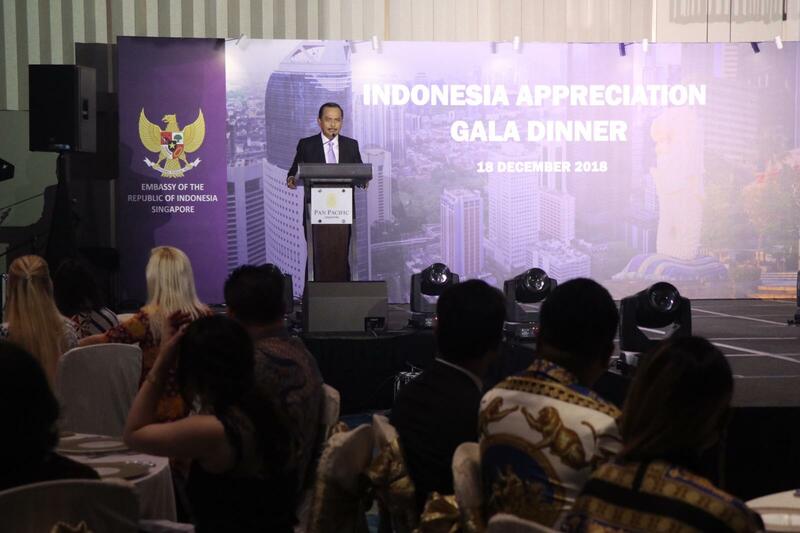 A total of 250 investors and business people from Singapore packed the main ballroom of Pan Pacific Hotel Singapore on 18th December 2018, to attend the “RI SING Appreciation Gala Dinner” held by the Indonesian Embassy to the Republic of Singapore. 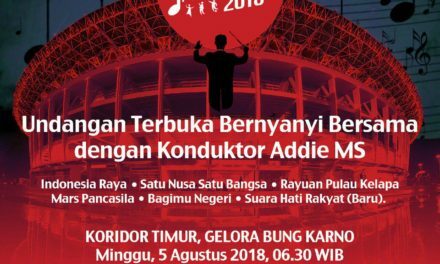 The annual event, which first held in 2017, aims to award Singaporean and Indonesian businesses that have contributed in advancing trade, tourism and investment (TTI) sector in Indonesia. The award was made as an effort for the economic diplomacy activities of the two countries, as well as strengthening the Singapore-Indonesia business community as well as diaspora by making a direct contribution to the bilateral relations of the two countries. In his remarks, the Indonesian Ambassador to Singapore, Ngurah Swajaya assured entrepreneurs and investors to continue investing in Indonesia. “There are many questions directed to me, especially how entrepreneurs and investors must respond to the political year in Indonesia. 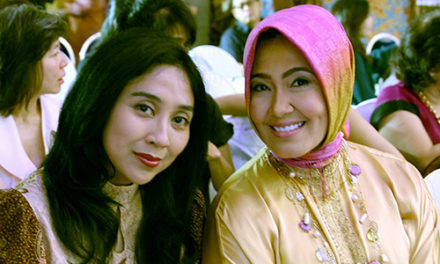 My advice is to you all is, keep investing, keep doing business in Indonesia, and still visit Indonesia. The political year will not reduce the commitment of the Government of Indonesia to guarantee businesses and investments” he said. Also present at the dinner, Chairman of the Singapore Business Federation, Teo Siong Seng. In his remarks Teo Siong Seng said that during 2018, the SBF has collaborated with the Embassy of the Republic of Indonesia and carried out business missions to five cities and provinces in Indonesia. “The business mission is to encourage Singaporean entrepreneurs to expand their business in Indonesia, and during 2018, members of the SBF carried out business missions to Jakarta, Bali, Yogyakarta, Bandung and Batam,” he said. “In addition, we also conducted Business Forum activities and business matchmaking between various regional governments with Singaporean businesses ” he added. A representative from Enterprise Singapore, Director of Southeast Asia Cooperation, Chew Hwee Yong conveyed concrete things that had been achieved. “Development of industry cooperation 4.0, is our common priority and ESG together with the Indonesian Embassy in Singapore have succeeded in developing such cooperation, including in Kendal Industrial Park,” he said. “The development of startups and the digital industry such as in Nongsa is also a common priority, and with the operation of around 60 startups in Nongsa is very exciting,” he concluded. In addition, Ambassador Ngurah also conveyed the opportunities and strategies for the future of both countries. “Along with the continuing uncertainty due to the rhetoric of the trade war between China and the US, the readiness of industrial complexes in Indonesia with gateways from Singapore, such as Batam, Bintan, and Karimun (BBK), provide an alternative to anticipate the trend of relocation of industrial estates from China, Taiwan and other East Asian countries. This is another opportunity to make the BBK’s as regional a production base for the ASEAN market with 630 million population size meanwhile anticipating the completion of Regional Comprehensive Economic Partnership (RCEP) negotiations in 2019 as the largest comprehensive economic cooperation in the world, “he said. At present the investment value from Singapore for the period of January-September 2018 is recorded at USD 6.7 billion, up 10% compared to the same period in 2017. 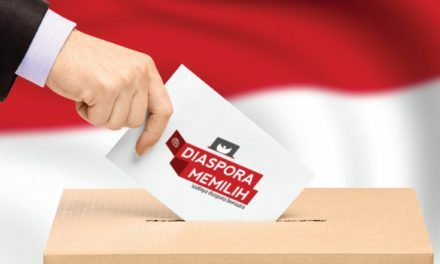 Meanwhile, tourist visits also increased 9.8% to 1.78 million foreign tourists for the period January-September 2018, and for trade, Indonesia’s total trade with Singapore in the period January-September 2018 was USD 25.4 billion, which increased by 18.2% compared to the same period last year or amounting to USD 21.5 billion. Ambassador Ngurah hopes that investment can penetrate the value of USD 10 billion and the number of foreign tourists can reach 2 million foreign tourists. Ambassador Ngurah also hopes that the appreciation night can strengthen the relationship between Indonesian and Singaporean businesses with relevant stakeholders and elements of government in Indonesia. “We now have to change the paradigm, not only sell potential, but have to sell concrete investment packages by facilitating both parties, business climate and supporting infrastructure and not only talking about potential in general, but also encouraging this activity to create contacts which then become contracts”, he said. It is expected that with the strong synergy between the Indonesian Embassy in Singapore and all other relevant stakeholders, investors are increasingly convinced to invest in Indonesia.